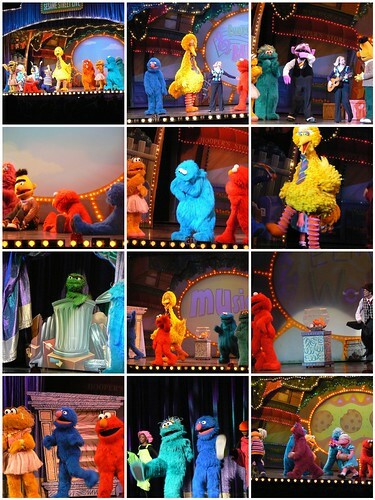 Over the last three years JL, NHL and I have seen three different Sesame Street Live shows. Each one has been fabulous and encouraged us to come back for another. 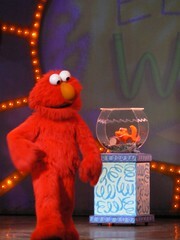 This year the show was Elmo Makes Music and it lived up to our expectations. 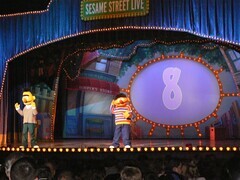 The show started with Bert, Ernie and Rubber Duckie coming out to introduce the letter and number of the day. 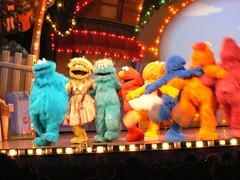 Soon after this the stage exploded with even more favorite Sesame Street characters. 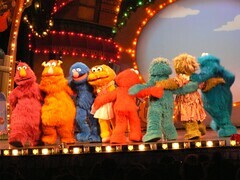 The kids in the audience went wild as Cookie Monster, Telly Monster, Prarie Dawn, Zoe, Grover, Big Bird, Elmo and others joined the group. JSL and Cousin S were taking it all in. 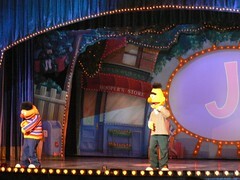 They just sat there watching as the characters danced and sang fun songs on the stage. The little guy started out on my lap and eventually got fussy and wanted JL. At that point I took over with the camera duties. 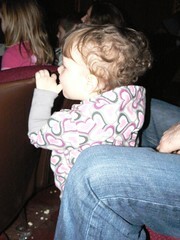 For the first half of the show Cousin S was happy dancing in front of Uncle I to the music. It was so fun to watch her with the Mamba number. Here is the way the kids looks after the switch off. After a while JSL started to get into the show. 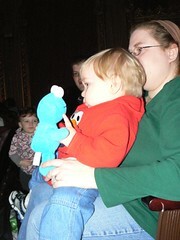 He was telling JL each time he saw Cookie Monster and Grover. They were definitely the highlight of his show experience. 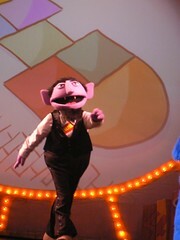 Cousin S was excited when she saw Count. She demonstrated her count laugh (priceless) and stood mesmerized with the happenings. 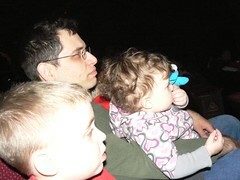 She was also quite fond of the part on Elmo’s World. 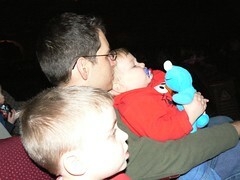 Soon after Elmo’s World it was time for the characters to take a break before the second half. Here are a few more photos from the start of the show. 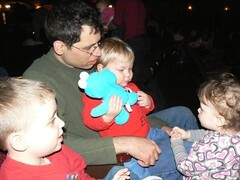 While waiting for the second half of the show the kids played by our seats and had some snacks. 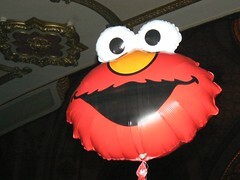 They also sold the $8 Elmos balloons that we did not purchase. 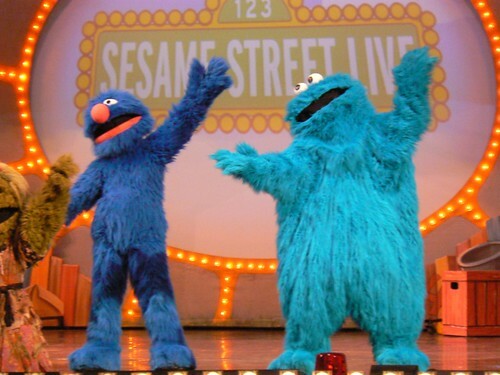 The boys talked about seeing Cookie Monster and Grover again. Little did we know that a mystery would take place. 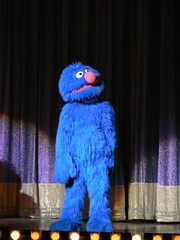 The mystery of the missing Sesame Street characters. The two in question are seen below. They are fuzzy and blue. One may be seen eating a cookie and the other with a Super cape. Why the mystery? Neither of these characters showed up again in the second half of the show! There was much disappoinement, but they did get over it. 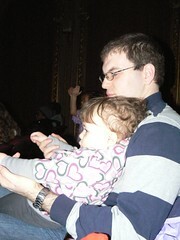 During the second half of the show Cousin S also made up her mind that she wanted to sit with Uncle JL and JSL. She made herself right at home and enjoyed the view. The rest of the show was more fast paced than the first act. 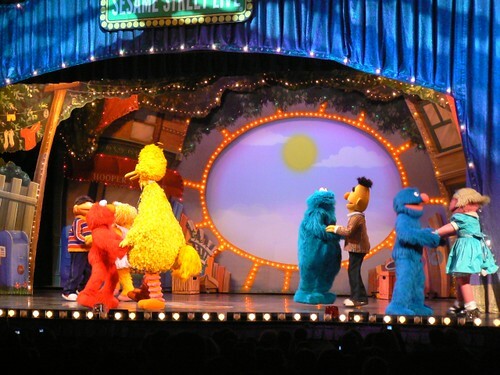 Bert came out for a 1970’s Disco number, Big Bird and Baby Bear (we all cringed when he showed up on the scene) sang Rockin Robbin, the Count did a tribute to the number 8, and there was the finale. Here are some favorite photos from the end of the show. 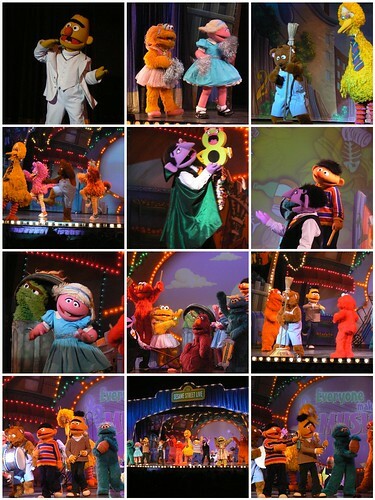 If you ever have the opportunity to see a Sesame Street Live show I highly recommend it. 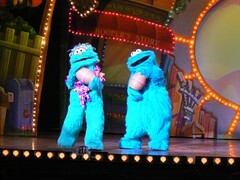 They put on a highly entertaining production for a reasonable price. I hope we will be able to see them again in 2010!